Will Hawkeye & Hank Pym Team-Up In Avengers: Infinity War? Next month, Marvel Studios will start production on Avengers: Infinity War, which is expected to bring the entire Marvel Cinematic Universe together. While no cast list has been released yet, it wouldn't be surprising if every established character in the MCU will come together to defeat Thanos. Over the weekend, two MCU stars, Michael Douglas and Jeremy Renner, hit the links together for a charity golf tournament, where they spoke about the possibility of meeting on the big screen. Jeremy Renner was first introduced in a cameo appearance in Thor, before starring in The Avengers, Avengers: Age of Ultron and this year's Captain America: Civil War. 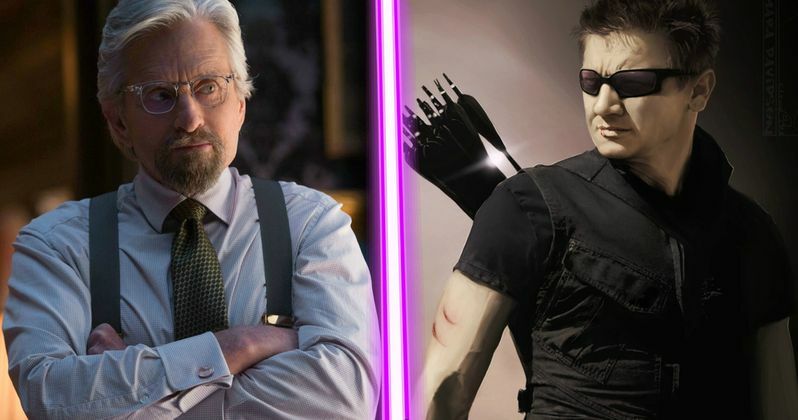 Micahel Douglas is a relative newcomer to the MCU, having only starred in last year's Ant-Man, but he told The Content Factory on the World Celebrity Pro-Am on the Chinese island of Hainan that he would love to team up with Jeremy Renner's Hawkeye in a future Marvel movie. Here's what Michael Douglas had to say below. "One of the joys of being in the Marvel family is they find ways of transitioning your character into other Marvel films, so hopefully there will be a moment in the future where Jeremy and I have the chance to be in the same Marvel film together. The Marvel family is pretty extraordinary. They have made 18 films and every one of them has been successful, which is an extraordinary accomplishment. I don't think any other studio has had the same degree of success." It is certainly possible that they could join forces in Avengers: Infinity War, but until Marvel unveils an official cast list, nothing is set in stone. Jeremy Renner wouldn't offer any specifics on what Hawkeye might be up to in Avengers: Infinity War, but he did say how excited he was to start filming next year with a "giant cast." Here's what had to say below. "I am excited to be doing Avengers 3 and 4 next year and I know it is going to be a giant cast... There are a lot of amazing cast members in that world and they are all converging, so who knows what is going to happen. I can't tell you or I might get hurt! Those decisions are above our pay grade, but we are just blessed and happy to be a part of the Marvel family. You just go to work when you are called and you know it is going to be great." The back-to-back production on both Avengers: Infinity War (May 4, 2018) and the currently untitled Avengers Sequel (May 3, 2019) is expected to last a whopping nine months, under the direction of Anthony Russo and Joe Russo. The Captain America: Civil War directors will be working from a script by Christopher Markus and Stephen McFeely, who wrote all three Captain America movies. Hopefully we'll get more on these superhero adventures soon as we get closer to production starting.